Crowdfunding platforms have been used by cash-strapped startups as a way to not only raise fund for ideas, but also to test if there’s a market for such ideas. The makers of the Klick Stylus, Morrison Innovations, earlier in June this year successfully used Kickstarter to raise enough funds to go-to-market with the capacitative and analog pen combination. It’s back again this time, using Indiegogo to raise funds for a newer and more slender brother of the Klick Stylus, the Klick Stylus Slim. And how much is Morrison Innovations hoping to raise this time round for the new project? Just $500. We ask Robert Morrison, owner and business development leader of Morrison Innovations, more about the Klick Stylus Slim and why they’re asking for such a low number. 1. 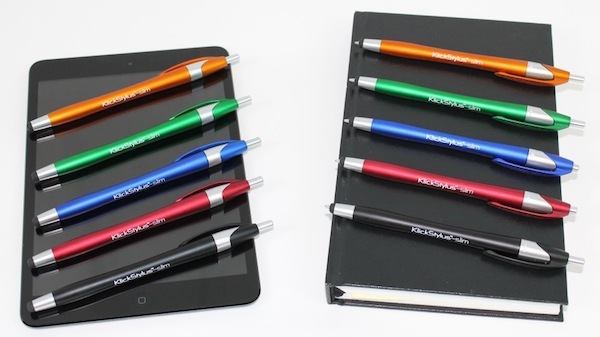 Stylus pens for mobile devices are a dime to a dozen. How is the Klick Stylus Pen and the Klick Stylus Slim different from all other stylus pens out there in the market? What makes the Klick Stylus different from other stylus-pen combos on the market is the patented stylus tip that allows the retractable ballpoint pen to travel through the stylus tip, allowing for a seamless transition from digital to analog mode on the same end of the device, no other stylus pen can offer that. An additional difference is the pricing, most Stylus-Pen combos cost over $40 each, we wanted to have our Premium Klick Stylus at $30 and our NEW Klick Stylus Slim is going to MSRP for only $15, hopefully allowing greater access to more touchscreen users who can’t justify spending $40+ on a stylus pen. 2. What has been the toughest part about the entire fundraising process? The toughest part has been getting exposure and press for our campaigns. You can only rely on word-of-mouth for a small percentage of referrals and leads, even our own social media efforts yield a small conversion. We have been trying to get top bloggers and websites to test our product and review it, which would drive much more traffic. 3. What was the experience like raising funds for the first generation Klick Stylus Pen, and what lessons did you glean from there that you applied this time round? The first generation Klick Stylus Pen was successfully funded via Kickstarter back in June and has had great reviews from users around the globe. What we wanted to do was make some improvements on the design and responsiveness while making the second generation more cost effective at the same time. So the Klick Stylus Slim is made from a specially coated polymer which increases responsiveness while decreasing the cost of the previous aluminum barrel. The stylus tip on the Klick Stylus Slim is a little thicker and has a plastic sheathing underneath that completely encloses the retracted ballpoint pen tip. IndieGoGo allows users to pay with PayPal (Kickstarter required Amazon payments which many people were unfamiliar with), which is much more widely accepted and used so we feel people are more likely to contribute that way. We didn’t need a lot of funding to get this second generation to market so IndieGoGo was a good choice since they have a $500 minimum. 4. Which brings us to… why use a crowdfunding platform, especially when the sum you’re asking for is so little? We most likely could have launched the second generation without crowd funding but we really wanted to involve our previous backers in the process since they were the ones that provided the valuable feedback on the first generation. We also wanted to tap into a market of tech enthusiasts and people who are proud to help a product and company they believe in, crowd funding definitely helps companies build a good rapport and fan base for life.